Beautiful watercolors. Inspirational. Great text about Bill Cunningham and the New York City fashion world he photographed. A book to buy, keep, and savor. 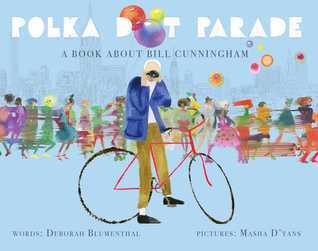 A fun introduction to Bill Cunningham for kids. Fun and fanciful illustrations. Good biographical info--not in a childish, poetic style. Inspiring. If I had known this was a book about a fashion photographer, I might not have bothered, but the illustrations are quite fantastic, and the great thing about picture books is that even with ones that you don’t love it’s hard to feel like you’ve wasted your time. If you’re into fashion and already know who Bill Cunningham was, you’d probably really love this book. This is a poetic, beautifully illustrated glimpse into the life of Bill Cunningham, a street fashion photographer. It's best for children who like NF biographies and for kids who love fashion & photography. Deborah Blumenthal - Deborah Blumenthal is an award-winning journalist and nutritionist who now divides her time between writing children's books and adult novels. She has been a regular contributor to The New York Times (including four years as the Sunday New York Times Magazine beauty columnist), and a home design columnist for Long Island Newsday. Her health, fitness, beauty, travel, and feature stories have appeared widely in many other newspapers and national magazines including New Yorks Daily News, The Washington Post, The Los Angeles Times, Bazaar, Cosmopolitan, Woman's Day, Family Circle, Self, and Vogue.